New University of British Columbia research finds that the success of weedy and invasive plants like the Jerusalem artichoke lies in their genes. A UBC computer scientist has invented a unique desk light that automatically switches from green to red when you are ‘in the zone’ and shouldn’t be disturbed by colleagues. 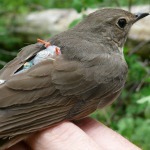 Scientists from the University of British Columbia have shown that there is a genetic basis to the migratory routes flown by songbirds, and have narrowed in on a relatively small cluster of genes that may govern the behaviour. Michelle Kunimoto’s bachelor degree in physics and astronomy sent her on a journey out of this world—and led to the discovery of four new worlds beyond our solar system. Just three years after crayfish were introduced to a B.C. lake, two species of fish that had existed in the lake for thousands of years were suddenly extinct. But it’s what took their place that has scientists fascinated. UBC received a $27.2-million boost today when 31 professors were appointed Canada Research Chairs. An isolated, iron-rich bay in the heart of East Africa is offering scientists a rare glimpse back into Earth’s primitive marine environment, and supports theories that tiny microbes created some of the world’s largest ore deposits billions of years ago. Compared to its celestial neighbours Venus and Mars, Earth is a pretty habitable place. So how did we get so lucky? A new study sheds light on the improbable evolutionary path that enabled Earth to sustain life. Ultra-marathoner and quantum physicist Jennifer Hoffman joins UBC as new CERC.